It has been Reported by some major news organizations that Jojo Lorquet, a protégé of President Martelly has been arrested for fraud. According to the source, he was charged with making false National Palace ID cards and selling them to people who would use that card to commit frauds. Report also indicated that Jojo Lorquet was also involved illegal activities and fraudulent transaction in Customs. There is currently a major operation in Haiti with list of 84 people in high government positions being sought by Haitian justice and law enforcement officials for all types of crimes an fraud. Many very close and long-time associates of President Michel Martelly are either in jail or in hiding. The president reacted by telling the press: "I am not protecting anyone". "I am attaching myself to the development of Haiti." 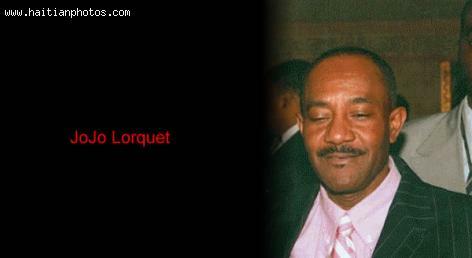 I do not understand, how Martelly can leave JoJo Lorquet in Prison. They have been friends for over 15 years. It only goes to prove that Martelly will throw anyone under the bus. If JoJo was actually doing anything that was wrong, how is it his best friend does not know anything or was not himself involved. JoJo and I are related. DEPI SE MOUN KA BAY PROBLEM NI KI SOTI NAN US POU AL KOROMPI ZOT KI TAP BAY TROUBLE DEJA. Amenez les, faites les voir au public et enfermez les.Zero tolerance a tous les amis du president inclus Jojo Lorquet.